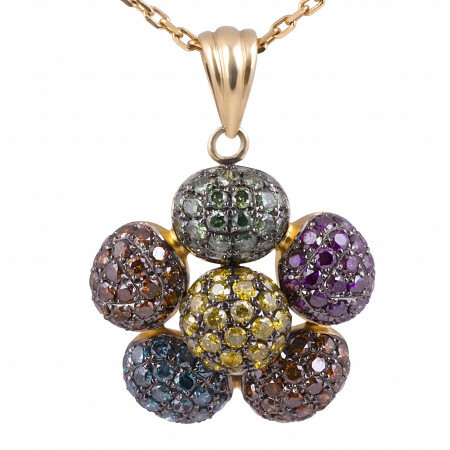 Showcase stand-out style with this colourful diamond pendant created in 14 karat yellow gold. The unique design is set with a combination of red and enhanced blue, yellow, green and purple diamonds totalling carat total weight. A striking piece. Exclusive to DG & Co Jewellery. Showcase stand-out style with this colourful diamond pendant created in 14 karat yellow gold. The unique design is set with a combination of red and enhanced blue, yellow, green and purple diamonds totalling carat total weight. A striking piece. Exclusive to DG & Co Jewellery. 24 Green Diamonds 0.46 Carat. 25 Purple Diamonds 0.47 Carat 0.48 Carat. 25 Blue Diamonds 0.48 Carat. 48 Red Diamonds 0.85 Carat. 30 Yellow Diamonds 0.58 Carat. Gold weight : 4.10 grams.